Discover unexpected and hidden delights and stay in a true medieval house (15th century) with the history of Prague pulsing in its walls. Escape the everyday with Attic Nerudova II. The apartment’s original period features, especially the exposed painted original wood beam ceilings, have been preserved and combined with modern conveniences and beautiful furnishings to create a memorable holiday experience. 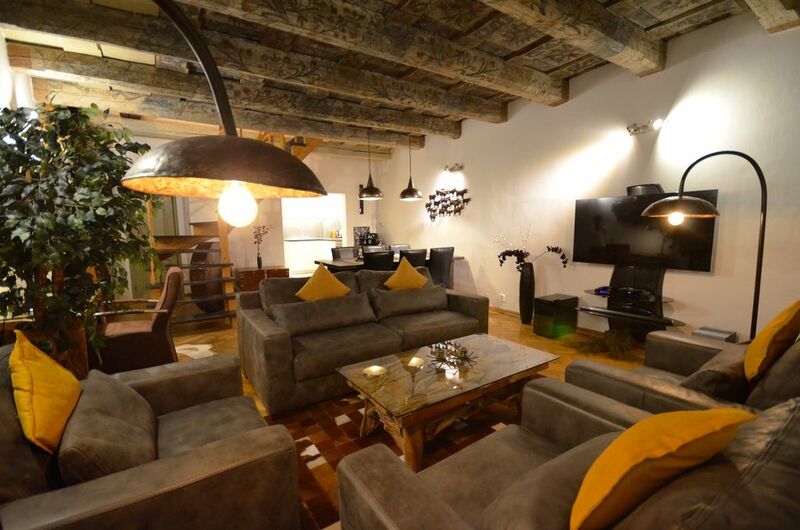 This three bedroom apartment of 176 m2, has a unique setting. On a great sweep of the “Lesser Town”, it reveals the very heart of Prague, from the Charles Bridge right down to the Old Town Square and the old Jewish quarter. The house is presided over by the Prague Castle, Visible through the roof windows. The Nerudova street is well-known for its ancient burgher houses, mostly now transformed into quaint restaurants, cafes and small shops. Offering contemporary chic at its best, this vintage flat, comes finished to a high standard with sharp decor, cosy furnishing and all the modern conveniences you could need to give you a comfortable and welcoming abode in the heart of Prague. The city centre is easily navigated by walk, however, due to its central location, the area has extremely good public transport connections, the access to all parts of Prague is easy and fast. The Apartment Attic Nerudova II is located on the second floor in a building without lift. Property description: 3 bedrooms, 2 bathrooms, large living room, dinning area, kitchen, office corner, anteroom, dressing room and laundry room. Beds disposition: 3 king size beds and 1 singe bed. Layout: This apartment has three levels. On the first one, you will find the entrance hall, the first bedroom, the first bathroom and the spacious living room area, you will also appreciate the large dressing room to store clothes. Upstairs you will access to the second bedroom, the second bathroom and a lovely open space (anteroom) with a single bed. Then, the last level but not the least, the third bedroom with its windows offering view on the Prague Castle. Highlights: Air conditioning (mobile units), FREE WIFI , large 3D SAT TV, home cinema sound bar, Bluetooth speaker for connecting iPods, MP3 players, Italian espresso machine, hair dryer, washing machine, dryer and ironing facilities. Medical and anti allergy mattresses, double sided oval make-up mirror, hair dryers, digital bathroom scale SAT TV in each bedroom.